Heroes In My Closet: Is That a Web-Shooter in Your Pocket or Are You Just Glad to See Me? Is That a Web-Shooter in Your Pocket or Are You Just Glad to See Me? NOTE: The accompanying photo of the author is merely used to enliven the posting and not connected to the tale therein. My recent encounter with dubiously-named hair-removal products reminded me of a story that my Marvel boss Barbara told me when I first joined her ranks of Spider-Man performers. 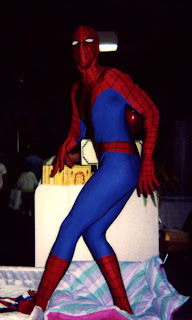 The suit—an all-encompassing skin-tight spandex bodysuit of red-and-blue with silk-screened webs and chest emblem spider—left nothing to the imagination. And there was the occasional observer who was shocked, even offended, by the simple appearance of Spider-Man, even though the actor inside the costume hadn’t said or done anything that would be remotely considered risqué had the performer been dressed in his civvies. Many others were merely uncomfortable by what might be construed as the “sexual” nature of the outfit. In offering me this caveat about wearing the suit, Barb recounted an appearance in Missouri by a former personal appearance actor. This performer, who shall remain nameless, not so much to protect his identity, as because I cannot remember his name nor whether Barb offered it in the first place, was known for his rather pronounced (ahem) “Web-Shooter,” for lack of a better term (Let’s just say the UPS charges on this package would have been cost-ineffective to mail!). His gifted “maleness (Thank you, Harlequin romances. )” coupled with the aforementioned perceived sexual overtones of the costume so offended the sponsors of the Missouri gig that Marvel henceforth imposed a self-regulated rule that barred Spidey appearances from the State of Missouri. But as for Barb’s reminiscence, I was immediately struck at the irony of the situation. After all, isn’t Missouri supposed to be the “Show Me” state?!! Doh! That is too funny. "Lets see, tall and lanky..check. Able to jump and is flexible...check. Not too big a package *pat-pat*...check!" Which cartoon character would you choose?